The last challenge! I've made it to the top three of Project Sewn and I can't thank you all enough for voting for my looks and being true sweetheartz. I hope that the whole series has inspired some of you to sew more for yourselves or start creating in general, as that's what it's intended to do. What has been your favorite theme so far? The guideline for this week's theme "Signature Style" was: "Design a look for yourself that is all you---your look, your style, what you love to make and wear." Perfect. I love making and wearing things that I love to make and wear. 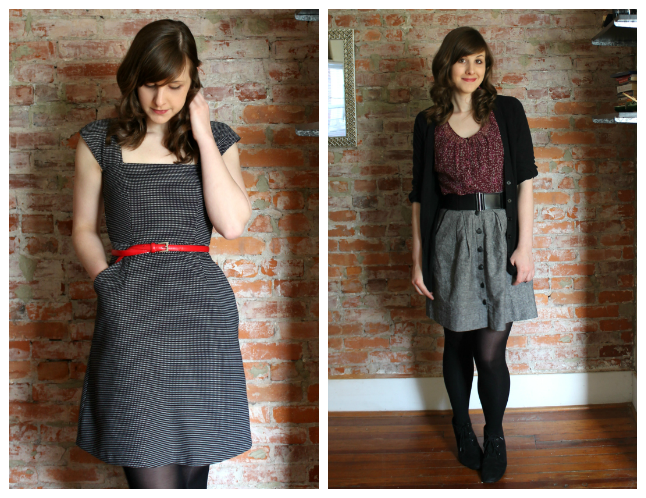 As you probably know, I kinda only wear dresses and skirts (see here, here and here for evidence). Casual dresses mostly, made in solids, stripes/plaids or geometric prints. Feminine silhouettes but nothing frilly. No embellishments, no ruffles, no ric rac. Pink is limited. Kinda preppy and modest, but also kinda cool (maybe?). Fitted waistline required, fitted skirts discouraged (less so lately, though). Must be beltable. Must pair well with a cardigan or cropped jacket. If it's not neutral, it's probably blue, red, or something in that color family. Must be able to be cut, sewn and finished in about a week or else I'll get bored. If it's not office-appropriate (i.e. knee-ish--length and cardiganable), it must be appropriate for my low-key social life that involves going to a lot of ethnic restaurants, drinking beer at microbreweries, sitting in my friends' living rooms, and walking around parks or whatever. I've never written out my style requirements before, but it's easier to do now that I've made it most the way through my first Me-Made-May. Seeing the weekly collections of photos and hearing the feedback in the comments gives me a better understanding of what kind of clothes I most like to wear and how other people interpret my style. This dress seems to hits all my key style points. I love it, anyway, so that says something. Is it epic enough for a Project Sewn finale? Maybe not, but it's going to get worn and enjoyed a helluva lot. 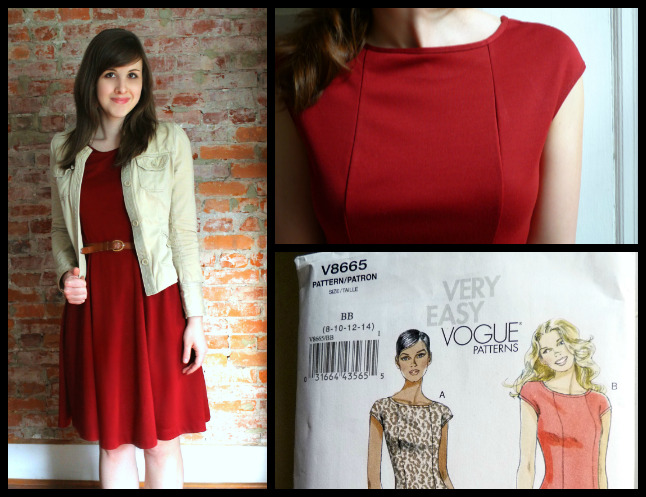 I started with Vogue 8665, a pattern I made recently in red ponte knit. 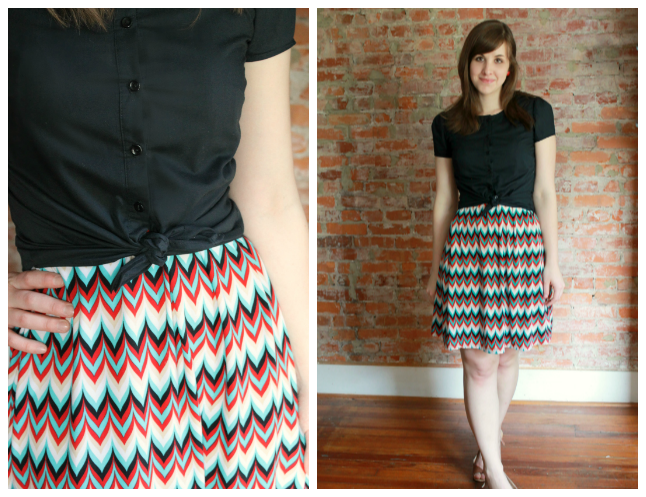 I chopped it at the waistline and added a quarter-ish circle skirt. 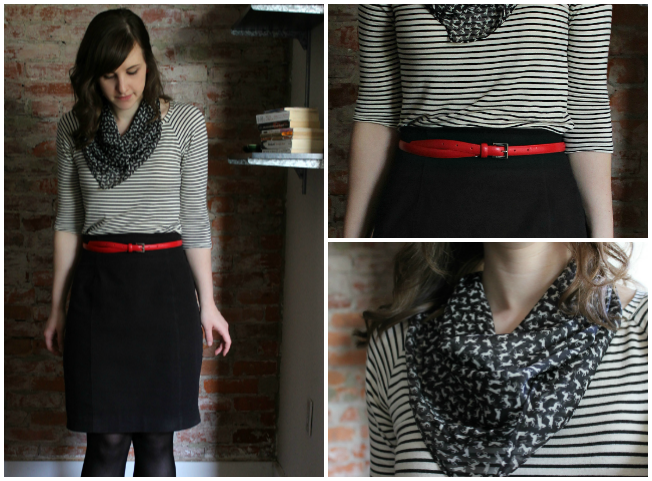 For more stripey fun, I added a 3" thick band of horizontal stripes at the hem. 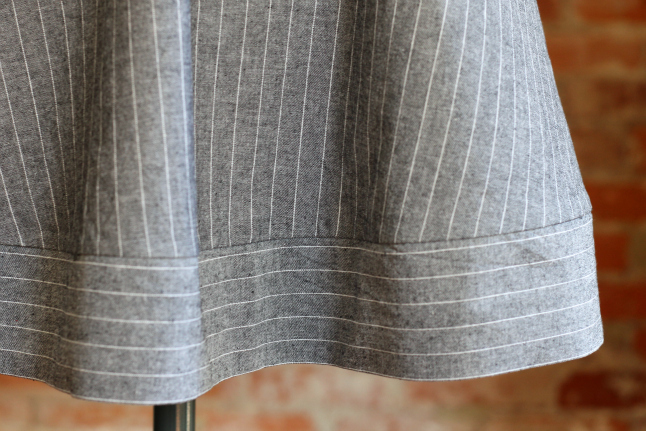 I was worried about how the straight grain of the band would interact with the off-grain circleness of the skirt, but it didn't freak out too much and actually added some needed structure and weight. It swings like a bell when I wear it. 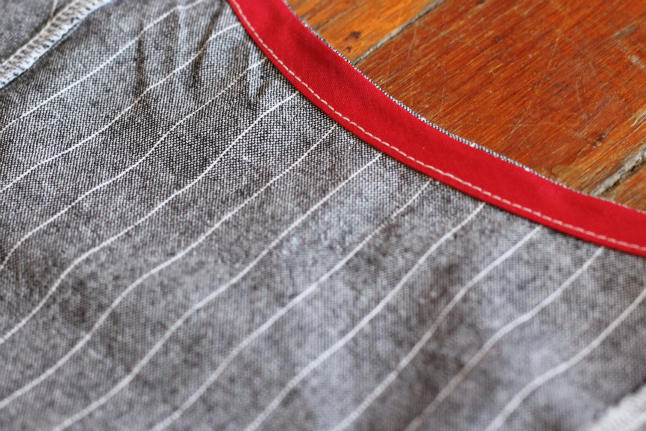 The fabric is pinstripe chambray from the Michael Levine online fabric store (found here). It's labeled as black and white, but altogether it looks gray, of course, which is exactly what I wanted. Gray looks great with yellow belts, and red belts, black belts, and even brown belts. I think I'm set. I lowered the back neckline by a few inches because the only matching zipper I had wasn't long enough otherwise. It probably would have been fine as is since the skirt is full, but I do like the look of the lower back. I used a regular zipper but decided to hand-pick it instead of fiddling with trying to get straight machine stitches all the way around. 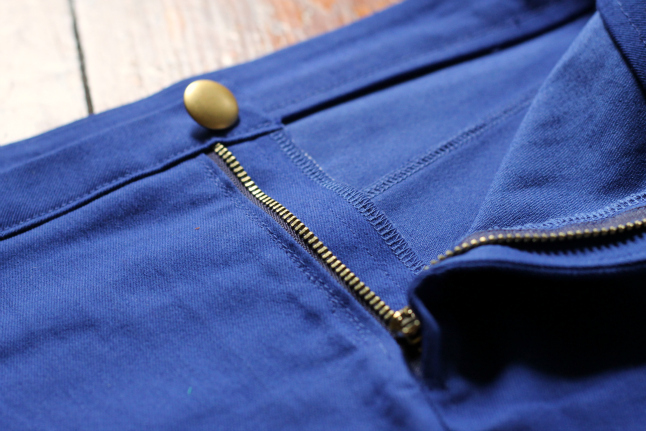 The little hand stitches sank into the fabric so they're basically invisible, even if the zipper itself is not. I didn't re-read the pattern instructions so I don't remember how it has you finish the neckline and armholes, but bias tape made the most sense to me. Of course I used red bias tape. Of course! So that's my final look! If you're feelin' it, please head over to Project Sewn and vote. This is my final solicitation for votes, I promise. Sweet! Onto the next. If you're just tuning in and wondering why I seem more narcissistic than usual with my selfies and am going overboard with the Picmonkey collages, it's because it's Me-Made-May 2-0-1-3. Every day during the month of May, I'm wearing at least one handmade garment. In case I'm audited by some MMM enforcement service, I'm taking daily photos to prove that I'm sticking to my pledge. Red ponte dress (blogged here, kinda, with my coverstitch machine review). The perfect work dress. 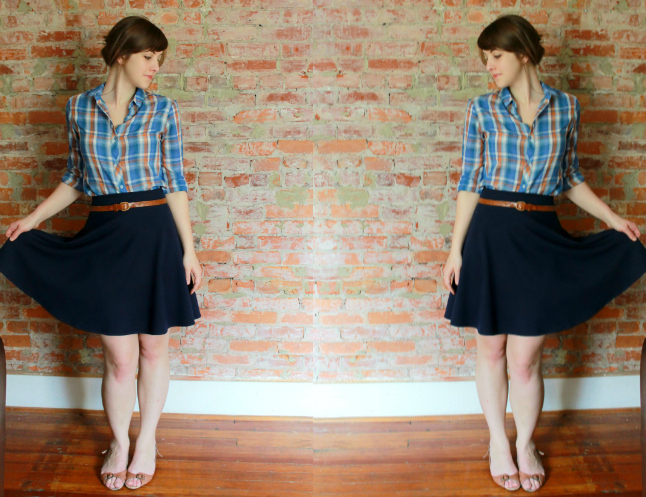 Thrifted plaid button-up with navy half-circle knit skirt (blogged here). Today a volunteer at the place I work complimented me out of the blue and said this outfit "really suited me." Can't say I disagree. Definitely an Andrea outfit. Black OWOP blouse (blogged here) over thrifted knit dress. One of the remaining survivors of my One-Week-One-Pattern sewathon last March. This blouse has always been a bit tight so I don't wear it much. I felt a little awkward tying it in a knot like this, but it's a good way to cover an unflattering dress bodice by featuring it as a skirt instead. White Archer shirt (blogged here) and blue denim Moss Mini skirt (blogged for my 80s challenge here). 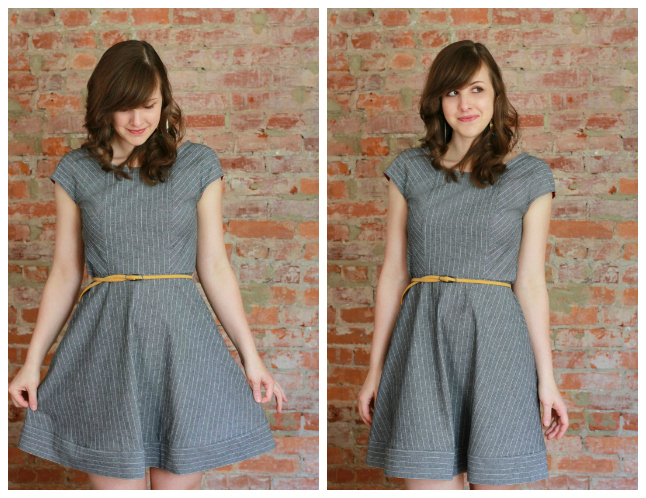 A Grainline Studio Pattern kinda day! 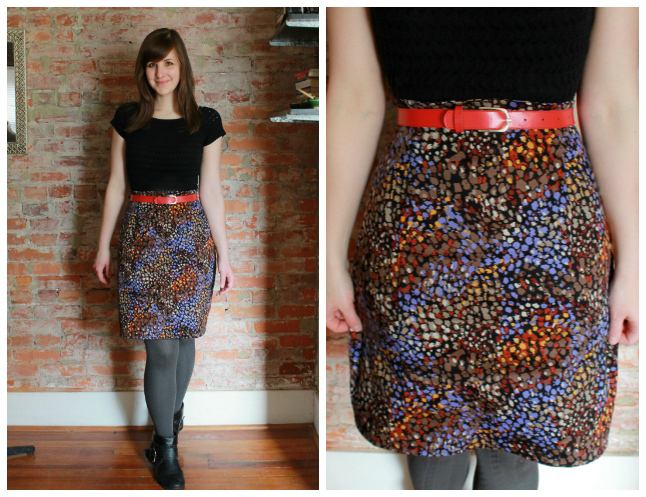 I finished this skirt on Saturday morning so was pumped to wear it out. But it looks like I wore this outfit to bed, damn. Tuck your shirt in! Use an iron! Well, I wore it to eat French fries and drink beer, so I was not projecting much elegance today as it was. Cute 'brella, though, amirite? Cute Philly sidewalk litter, amirite? 80s outfit (blogged here). Tubular. I'm digging this jacket more and more. It's stretch denim and actually fits my broad back so I can flail my arms around like a normal person (who flails). My other fitted jackets provide no such luxury. Cambie dress (blogged here). Zzzz. I mean, it's fine, I'm just kinda tired of it already. Maybe it's because I look so cool in my 80s outfit from yesterday and I look so... precious in this knee-length A-line dress and cardigan combo today. I think my style is definitely changing (for the worse?) because I just want to hack off this hem and yank down the neckline. Whoa, girl, calm down. 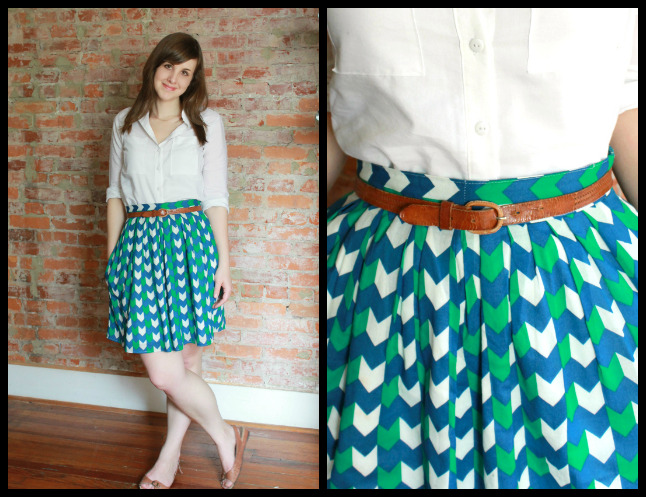 White Archer shirt again (found here) and chevron print skirt (blogged here). I'm pretty excited that I'm still actually wearing stuff that I made a full year ago. Last year at this time is when I really noticed my sewing starting to improve, which means more wearable and long-lasting garments, hoorah. I know I wore this shirt on Saturday but it's great to finally have something to wear with this skirt. For some reason I always struggled to style this thing because I didn't want to overwhelm my body with color and prints. A basic white button-up was the ticket. So what have I learned so far? I should stop wearing the same shoes every day. And since they're secondhand Urban Outfitters shoes (shudder), they probably have 3 wears left in them before they fall apart. Three challenges in! I'm thrilled to have made it to this point of Project Sewn, so thanks to those of you who have voted for any of my outfits. Today is the reveal for the next challenge, for which we had to sew something inspired by the fashion of the 1980s. I'm excited to see what my fellow contestants have come up with for this one, because there are so many routes you can take. 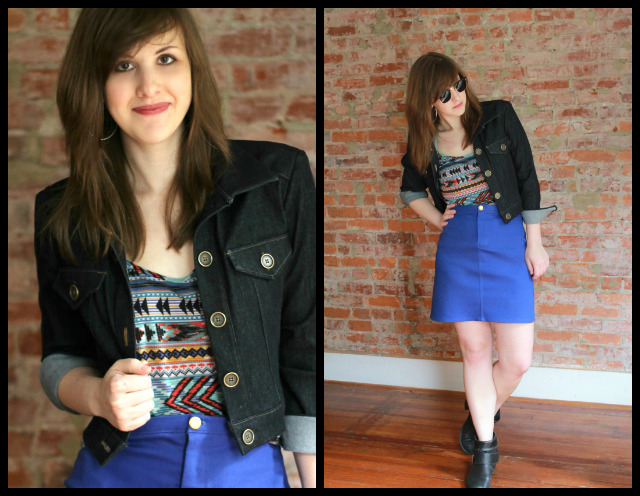 I decided to go with a jean jacket, a colorful slim-fitting fly-front denim skirt, and a graphic top. I almost can't believe I finished this whole outfit by the deadline; come Thursday, I had only started the jacket. I was in a cold sweat, scurrying around JoAnn's after work on Thursday, hurling bolts of cobalt blue stretch denim and interfacing at the woman behind the cutting counter yelling "Chop, chop!" Just kidding. I don't use fabric cutting puns out loud. All of the Project Sewn challenges so far have been difficult when it comes to settling on an idea, but this one was the hardest by far. I don't personally remember fashion from the 80s, since I mostly wore diapers and onesies back then, and there's a fine line between an 80s-inspired outfit and an 80s Halloween costume. I admit that it was extremely tempting to make a sequined Tina Turner dress since I actually had an excuse, but I decided to go for something that was a bit more practical. Man, there were some scary silhouettes in 80s fashion. I just couldn't go dramatic with it, I'm sorry. I've been wanting a jean jacket anyway, so I thought this was the perfect time to make one. I'm not a fan of the acid-washed look, so I used this dark denim from my stash since it's a bit more modern. 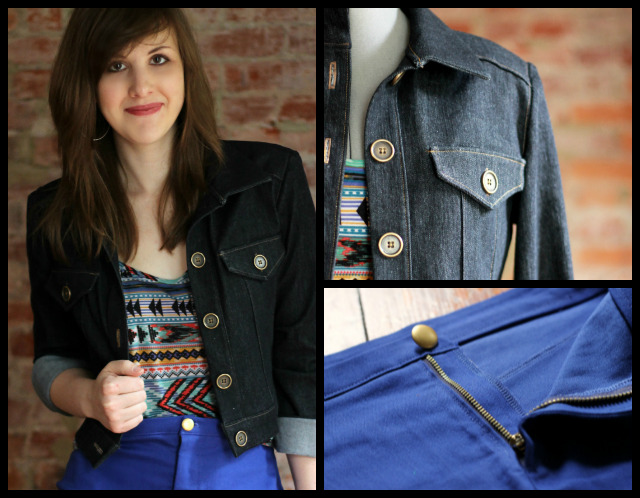 I used a Burda PDF pattern, the cropped denim jacket from 02/2010 (here). Luckily I had extra yardage because I completely forgot to add seam allowances when I cut all the pieces out the first time. Genius. Burda magazine patterns are insane. How would any beginner know where to start with them? For this jacket, there were three different style patterns printed on the same sheets, but I didn't know that until I realized there were extra pieces that didn't actually go with this jacket. Plus there are no illustrations for the steps, and adding your own seam allowances means a higher risk for inaccuracies. Anyway, I like the jacket for the most part. The buttons are kinda big, though. For the skirt I used the Grainline Studio Moss Mini Skirt pattern, omitting the pockets and lengthening view A by 4 inches (I wanted the length but not the hem band of view B). I topstitched all the seams, though it's not called for, just to get a more casual jean skirt look. I wanted it to sit a little higher than intended so I cut a size 4 in the waist and graded out to a size 10/12 at the hips. I used a denim/lycra blend for the skirt -- which creases and wrinkles like crazy, btw -- but if I used a non-stretch woven I'd probably go up a size further so I could comfortably sit. I really like this pattern and will probably make more. Getting tired of all my work-appropriate skirts and having nothing to wear out on weekends. The top had no pattern... I just improvised a baggy wide-neck kimono-sleeve tee like Molly Ringwald wears on her birthday in Sixteen Candles. I know I should have layered it over another tee but I can only make so many pieces in a few days' time, people! This jersey was a local find I already had in my stash because it's awwwwwesome. Lucky break that it had an 80s vibe with the colors and geometric shapes. Huxtable-approved, I hope. I swiped Corey's sunglasses to use for these photos since they're clubmaster style, actually from the 80s. I think he found them on eBay. Konnichiwa y'all. How appropriate that on the day I'm posting my second full week of me-mades, my friend Abby from Dear Abby Leigh is hosting me on her weekly blog series, "Dress for the Day You Want to Have." Not many people I know in real life have active blogs (after the social demise of the mighty LiveJournal, haa), but Abby had one going strong before I was a reader or participant in the blogging community at all. I owe her for being part of my inspiration to start a blog (without her knowing it) as well as introducing us to the best blood orange margaritas in Philly. Her "Dress for the Day" series features stories, cute outfits, guest posts and a linky party that celebrates the clothing that helps us feel confident and inspired each day. Today I'm over there talking about my aspiration to create a fully handmade wardrobe. Thanks for hosting me, Abby! Move back to Pennsylvania! Anyway, check it out. Blue and black psychedelic lace dress. Wuuuttt! Not blogged yet because I made it last week while I was supposed to be working on my Project Sewn outfit. I procrastinate my sewing by... sewing? Anyway, I'm kind of in love with this dress. It's hard to tell but the fabric is a knit, and the black is a crazy zig zag lace that is pre-fused to the blue underlining. The pattern is New Look 6176 with modifications, like fisheye darts in the front. Did you know that New Look has 18 million shift dress patterns available that look exactly like the Colette Laurel pattern? Just sayin'. 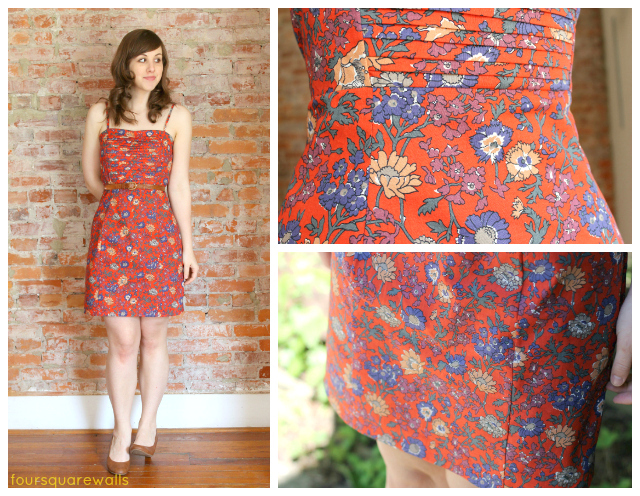 ANOTHER buttonless Beignet, this time in a bizarre print, ALSO unblogged. Sowwy. This fabric is a stretch cotton sateen that's easily the most expensive fabric I've ever bought from JoAnn's. And I don't even know for sure if I like it, because it kiiiind of reminds me of animal print and I do not wear animal print. Anyway, did you know that you can squeeze a size 6 buttonless Beignet skirt shell out of less than one yard of 59" fabric? Now that's efficiency at its finest. 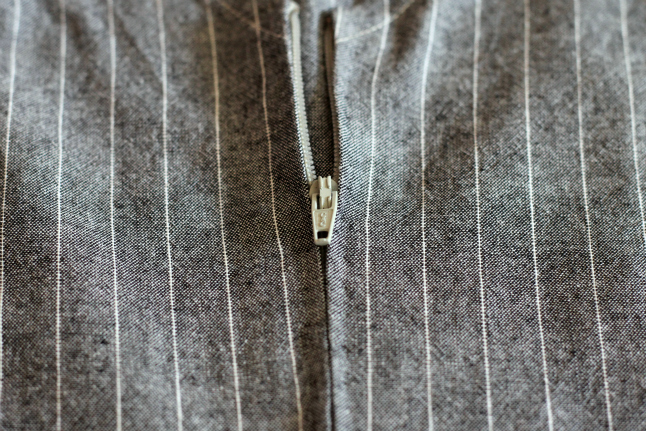 I realize my pieces are slightly different because of the closure modification, but the button placket facing alone would not require an extra yard and a half, I promise. Hey frump mcgrump. 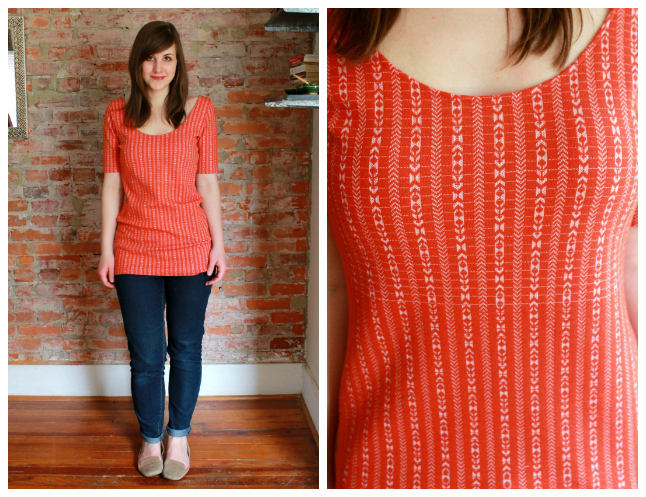 Retro orange knit top (first blogged a million years ago here) and F21 jeans. So I actually did wear jeans for Casual Friday. I was not comfortable at all today, despite the fact that I'm dressed down. The temperature was above 80 degrees, meaning this medium-weight vintage polyester shirt was a little toasty. And the shirt neckline is slightly too wide so I had to wear a strapless bra, which is not fun when you don't have fitted woven clothes to keep it in check. And the top is a bit tight in the hips and loose in the waist, so I kept having to tug it around. Wear and learn. Stripey jersey dress (blogged here). Ooh nice awkward iPhone photo, taken on our walk back from an Indian food gnosh fest. I look so short and red in this photo! Is Corey 8 feet tall? I was thrilled to remember that I had this dress tucked back in the depths of my closet. I wore it several times in the winter but never felt that comfortable because cotton jersey and thermal tights do not get along well. I think the dress looks better with bare legs, so I'm glad to officially bring it into my warm weather wardrobe rotation. It has a coffee stain on the skirt front now but do I look like i.g.a.d? 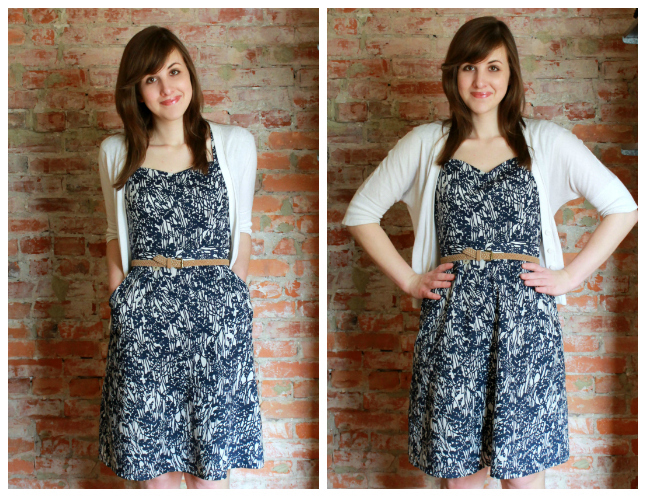 Pintuck bodice sundress (blogged here). 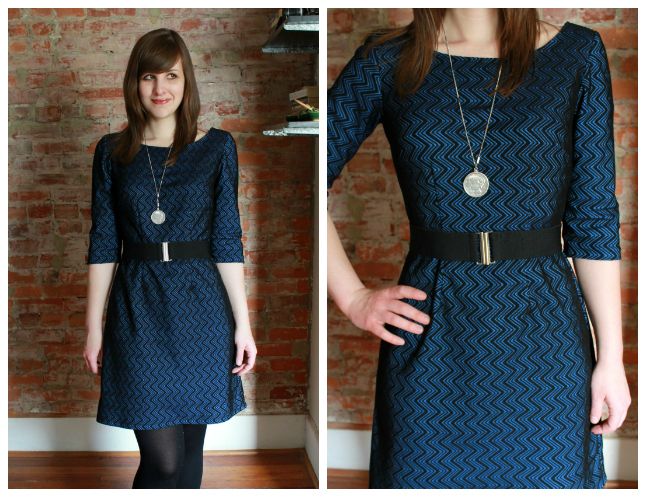 I just posted about this baby so I have no more words except that I love this dress. Cocktail Cambie dress (blogged here) and gray linen Kelly skirt (blogged here). More black, more white, more red belts, more gray. I almost wore a black top with that gray Kelly today but it felt sad and stuffy. The purple top is secondhand. Oof! Still enjoying my participation Me-Made-May, but I'm likely going to have to start repeating pieces soon. Halfway through -- how have you fared? 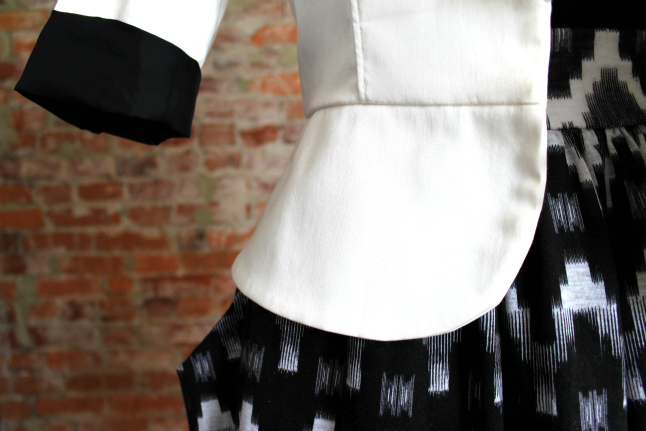 An enormous thank you to everyone who voted for my outfit for the Black & White theme on week one of Project Sewn. I actually won the first round! The first challenge was certainly nerve-wracking, as I had no idea what to expect from my fellow contestants and didn't know how the readers/voters would respond to our different styles. Well, I still don't have a clue, but that's the fun of it, yes? I'm just doing the best I can. I really appreciate your support! So onward we sew. Here is my entry for round two. The challenge was to sew a sundress. It sounds more straight forward compared to the theme of "black and white," since we only had to sew one specific kind of garment. But geez, the process of deciding what kind of sundress to sew was still a doozy. This is one of the 1,000 reasons I would never aspire to be on the real Project Runway show (besides the fact that, yaknow, I'm not a fashion designer): it would be impossible for me to decide on a design and fabric in the 30 or whatever minutes they're given. For this challenge I spent a minimum of three evenings frying out my eyeballs on Pinterest, Burdastyle, fashion blogs and online boutiques, trying to find inspiration but mostly getting over(or under)whelmed and frustrated. Once I finally came up with the pintucked bodice design idea and figured out how I would do it, I then agonized over fabric choice. At one point I was just sitting on the floor of my sewing room, buried up to my waist in different dress-weight fabrics, whining with indecisiveness. It was actually my boyfriend Corey who immediately pulled out this vintage floral cotton and said I had to use it. I rarely wear florals so I didn't even consider it, but I'm glad he convinced me because the fabric really is quite beautiful and I think it's a successful look overall. It was part of the large vintage fabric haul I received from the generous woman who was cleaning out her mom's house (story here). That stash has served me well. 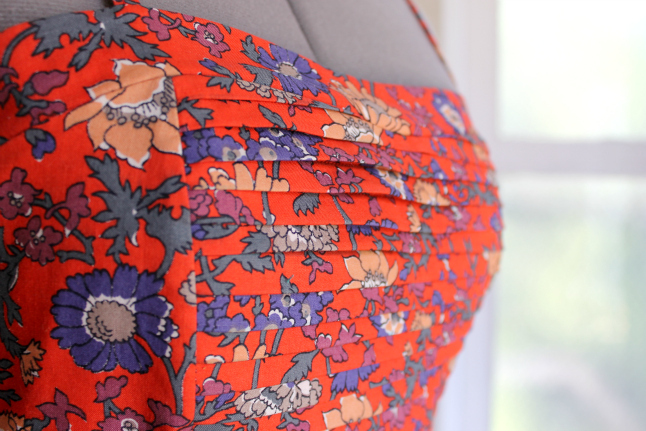 To make it, I started with the bodice lining pieces of Simplicity 2250, a Cynthia Rowley dress pattern, because it had the princess seams and subtle sweetheart shape I was looking for. I first made my pintucks on a large rectangle of fabric, and then cut the middle bodice pattern piece from that. I really love this detail, though I know it gets a little lost and disjointed in the busy print. It's pretty effective in real life, though, so I stand by it. I may try it again on a solid chambray or something...ooh. The skirt portion is made from --what else-- the Colette Beignet skirt pattern, altered in my usual way to eliminate the button-up front. It definitely took some tweaking to get the princess seams of the Simplicity bodice to align with the skirt seams, but I'm pretty happy with the fit overall. I was tempted to make a big floofy circle skirt at first, but the fabric and bodice shape was already pretty feminine so I decided to make a sleeker skirt to help balance it out. And now I'm protected from gusts of wind! Believe me... I love my floaty skirts, but it is no fun to have to keep those in check when you're trotting down the stairs as the subway comes rushing into the station. 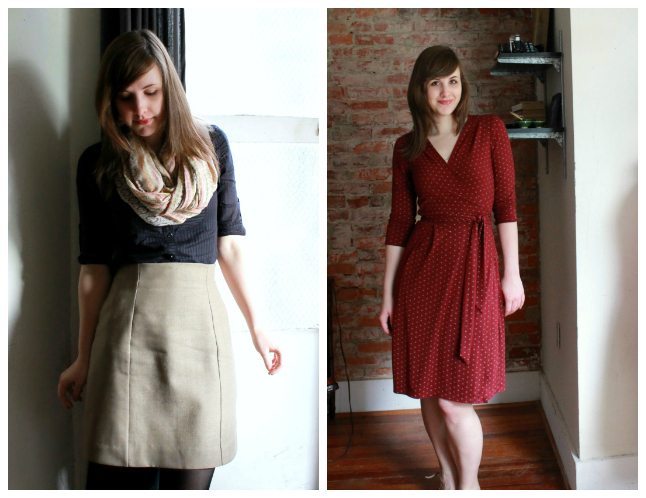 I feel like I owe the fine people of Philadelphia a public apology for my ongoing circle and wrap skirt indecencies. And the city of Philadelphia owes me an apology for having a particularly windy Market Street. The dress is fully lined, which I kind of made up as I went. 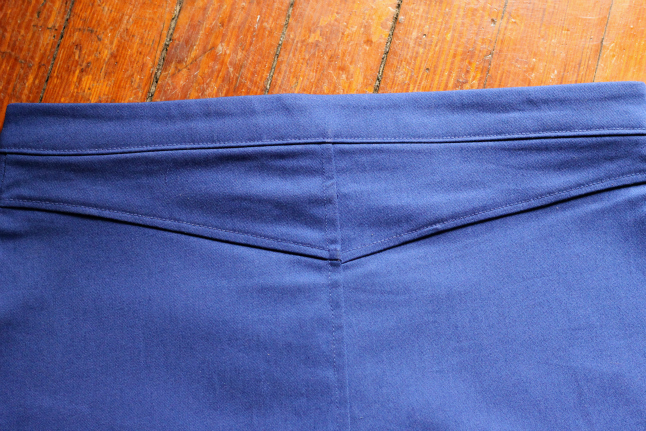 The skirt portion is rayon bemberg with French seams. 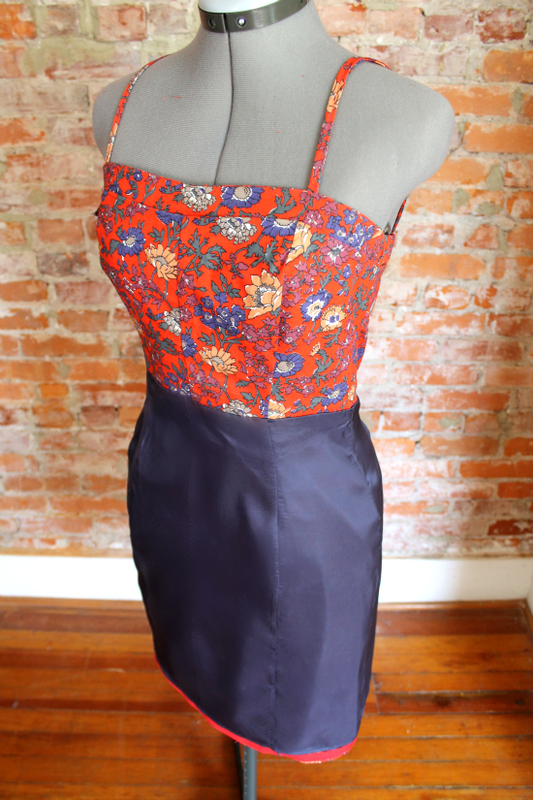 I hemmed the skirt shell with red bias tape and a hand-sewn blind stitch. It's super invisible on this print! I couldn't get the dress fully zipped on my mannequin, even with the smallest torso set, because her cup size is bigger than mine. RUDE, Singer, rude. So that's my sundress! 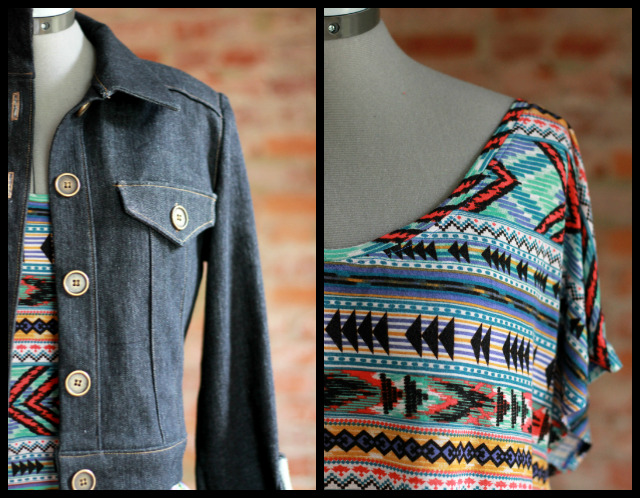 Check out the rest of the entries in this week's round of Project Sewn and be sure to vote on your favorite. Thanks again, sweet peas. Yep, your sewing blogroll is regurgitating the same title for everyone's posts this month. Mmm, mmm, good, MMM is here! It seems we all have different ideas of what constitutes the "first week," but I've interpreted it to mean 7 consecutive days. 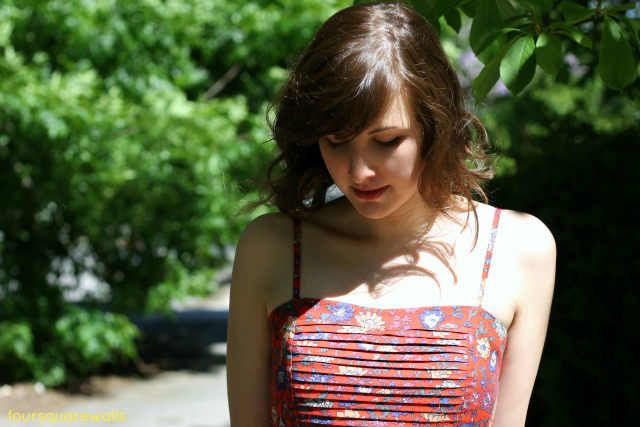 So welcome to my first weekly post in which I showcase the handmade outfits I scrounged together for Me-Made-May 2013. My pledge is to wear at least one handmade item per day during the month of May, so this is what you'll witness below. I wrote in the present tense for each day because I actually updated this blog post at the end of every day. That's commitment, man. Striped jersey top (blogged here) with black buttonless Beignet skirt (unblogged - similar here). You'll probably see a lot of this black skirt because, hello. It's black and it's a Beignet, my fave-o pattern. Today I decided to be "brave" and mix prints. My mom bought me the scarf from Modcloth -- it's soft as silk (but not actually silk, o' course) and it's got poniiiiies on it. 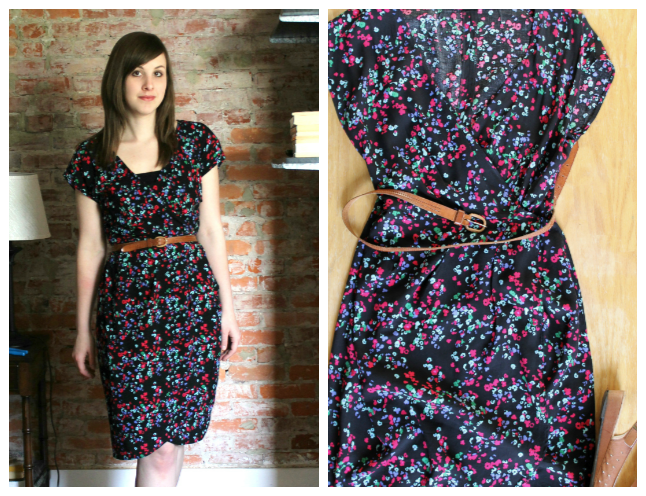 Floral wrap dress (blogged here). 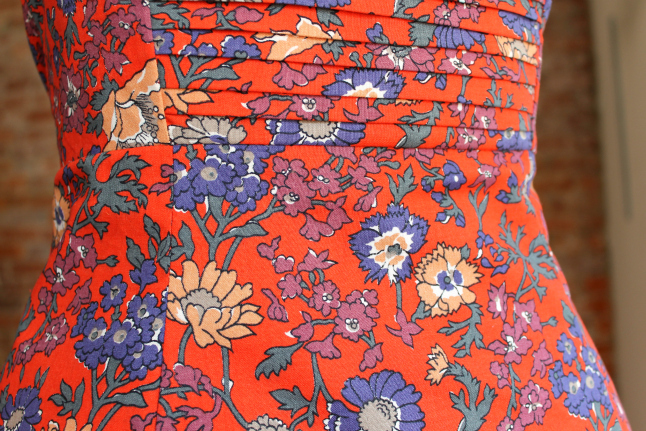 This is one of the very few floral-printed garments I own, handmade or otherwise. I'm more of a graphic print or plaid kinda girl, I think. Sometimes I love this dress and the colors and the fact that it's rayon, but sometimes I'm just not feelin' it (hence the dead-eyed look in my photo above). I haven't worn it since last summer, though, so I thought I would give 'er another go. 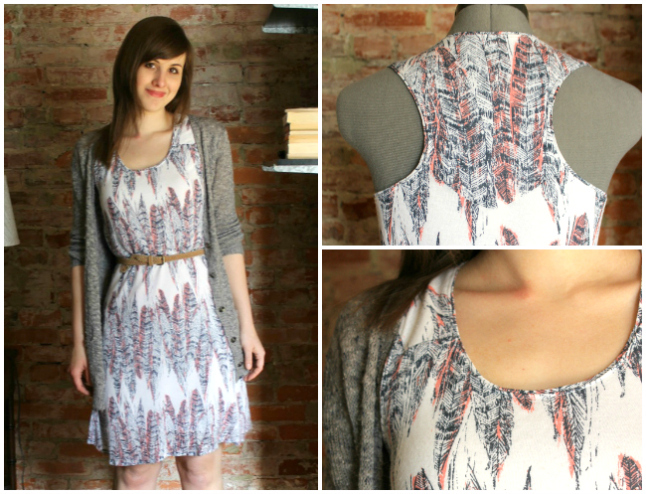 Jersey feather racerback dress (blogged here). Ugh, full-length shot is blurry. I need a camera shutter release remote. I ain't reshooting at this point, though, that's for sure. It's ~Friday~ and this stressful work week is over and it's beautiful outside and some neighbor is blasting "Get Down Tonight" by KC & the Sunshine Band out their window (no joke) and I have adult beverages to consume on the asap. Anyway, this is the dress I wore today, paired with a gray cardigan from Forever 21 that is barely intact. My colleagues tease me for rarely wearing jeans on casual Friday, but what's more casual than a racerback jersey dress, aka belted jim jams? My Project Sewn contest outfit for the "black and white" theme (see here for the full blog post and vote here for me if you're so inclined!). I actually did spend most of my day in this ensemble, red lipstick included, even though I was trucking up and down the stairs doing laundry in between sewing sessions and photo ops. Yep, neighbors, I always do laundry in heels. 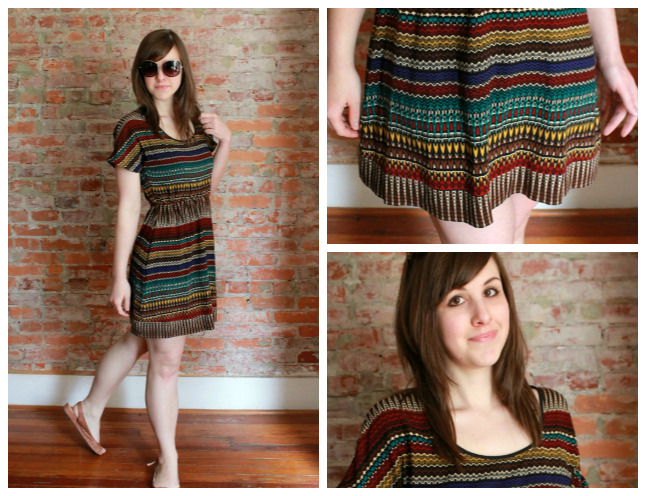 Tribal dress (unblogged). Today was another clear sunny day so I wanted to pretend like it was warm enough for this dress alone, but it wasn't. I eventually put on tights and a jacket to go out for Cinco de Mayo dinner. I made this dress in like 3 hours a few weeks ago-- it's just a kimono tee thing with an elastic waist. The fabric is rayon --a rare find at JoAnn's-- from the "tribal fabric" section. Who do you think is the tribal fabric consultant for JoAnn's? What tribes are we talking about here? Do I sense some political incorrectness? Back to work in my usual suspects. Left - my (wrinkled) beige buttonless Beignet worn with secondhand blouse and gift scarf. Right - my polka dot wrap dress. 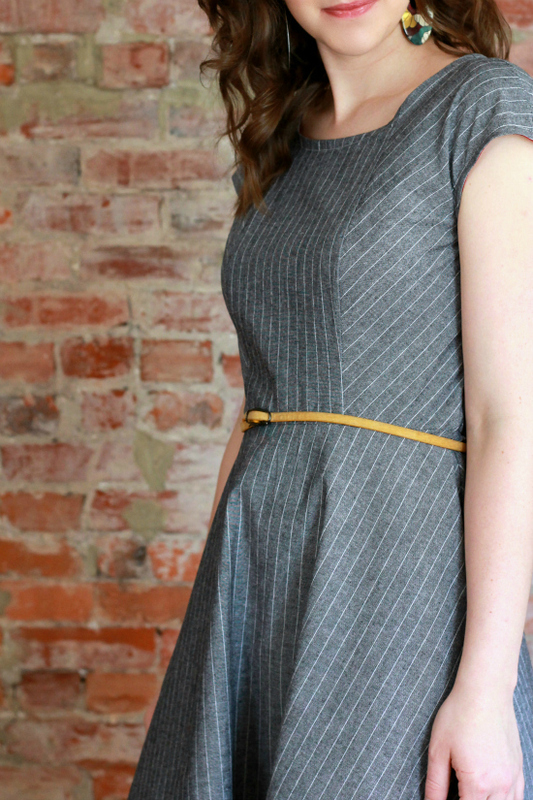 So glad I made this wrap dress -- it's a no-brainer piece for work, which I certainly needed this morning with only five hours of sleep and a complete lack of interest in the whole primping process. Just throw on one thing and, magically, you're fully dressed. Not very interesting for MMM, though. 7 days and 7 outfits down. 24 to go-o-o. Let's see if I can learn to focus my camera by then. I don't feel wardrobe-challenged yet, but who knows how I'll be limping along by the end of this. If you're participating in Me-Made-May, how are you feeling at this point? Allo allo. It has begun! To catch you up (if needed), I am one of six contestants in a new online sewing challenge called Project Sewn for women who sew clothes for themselves. During the competition, we sew outfits for a chosen theme each week, with one winner determined by votes and one blogger unfortunately knocked off each go-around. At first it was difficult to settle on my strategy for the first challenge. Should I try to wow everyone out of the gate and make a dramatic silk ballgown or something, or should I stick with my usual aesthetic and make something more wearable and practical? Well, since I can't make an epic ballgown in a week while working my normal full-time job (nor do I want to), I went the latter route and I think it was probably the wise choice. Plus, I think that's what this challenge is about --- inspiring women to sew for themselves and add pieces to fit into their existing wardrobe. So! Here are the three black and white pieces I made, topped off with a red belt of course. 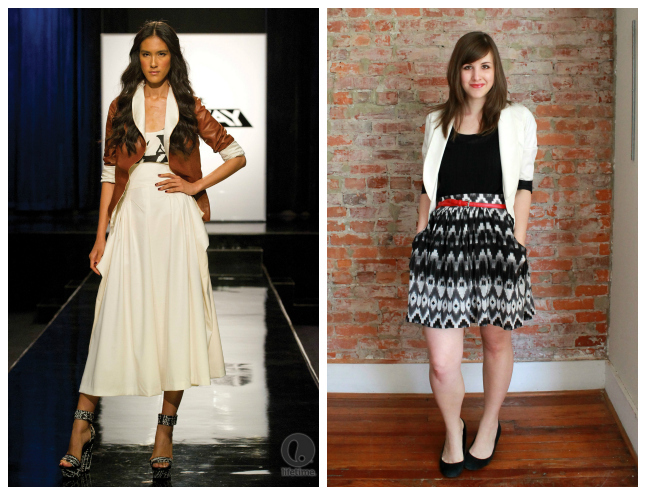 My inspiration for these separates was actually Stanley's winning design for the Marie Claire editorial challenge on the most recent season of Project Runway (see here). He sewed an open leather jacket, drapey white culottes and a black and white graphic tank. I knew for this challenge I wanted a gathered skirt with draped pockets, a fitted tee or tank or some sort, and a white blazer to top it off. The pushed-up blazer sleeve is all the rage, I've observed during an intense Pinterest/Kendi research sesh. No tea-length culottes here, though. Think she's taller than I am? For the blazer I modified New Look 6013 quite a bit. (FYI we are allowed to use patterns for Project Sewn.) The shell fabric is a stretch cotton sateen that was stained on the selvedge so I got it for $1.99/yd like a boss. As for changes to the pattern: I added a full lining, cropped it at the waistline and added a rounded peplum for some shaping, de-pleated the sleeve caps and added contrast black lining just to the rolled up sleeve part. 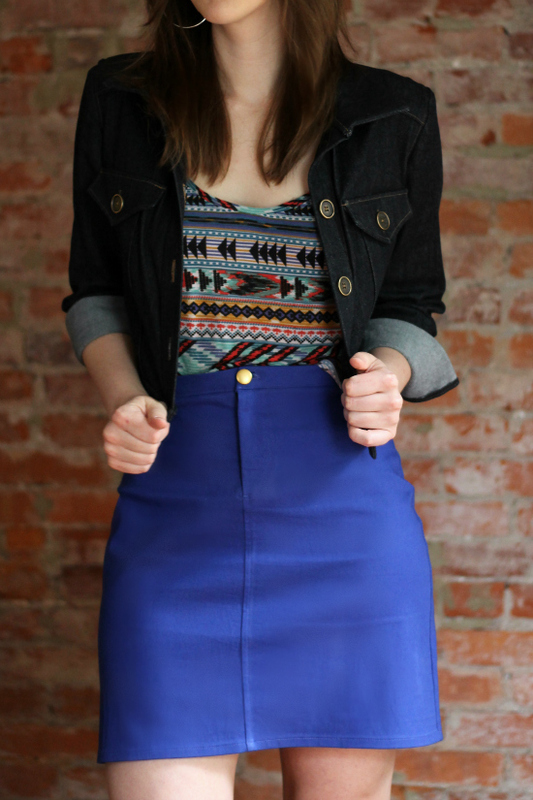 The skirt is pattern-less, made from ikat printed jersey. I've always loved ikat prints but I think this is the first time I've actually bought some. 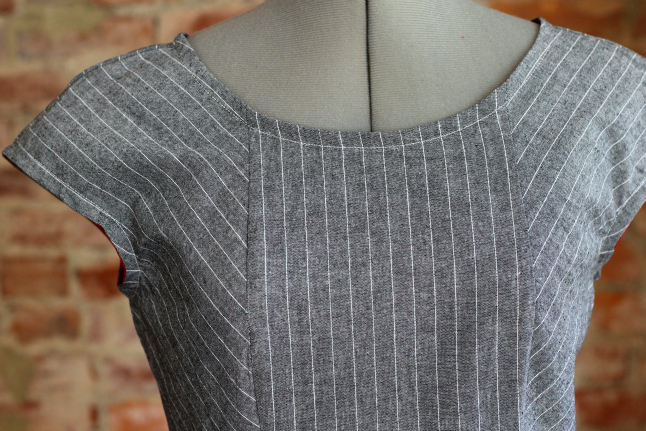 I actually first intended this fabric to be the tank top and the black pleated fabric to be the skirt, but the jersey is so extremely lightweight that my machines ate it alive when I tried to bind the neckline and armholes. I then realized it deserved more attention anyway, so I made it into a gathered skirt with a thick knit-interfaced waistband instead. It's lined with black rayon bemberg and hemmed with the aid of fusible hem tape for stabilization. I gathered the fabric by zig-zagging over a long strand of dental floss. I highly recommend this method, as it's much smoother and faster than stitching three full lines and yanking on the thread. The cap-sleeved top is made of some sheer accordian-pleated stretch fabric. To make it, I traced the Sewaholic Renfrew pattern front for both the front and the back, deepened and widened the neckline, left off the sleeves and sized it down severely to accommodate the stretch of the fabric.